Released yesterday CVE-2016-6210 has garnered quite a bit of attention in the community. Here if you just came for the code. From people expressing their distaste in the overall "hype", to a large number of people claiming that either they cannot get it to work, or that the vulnerability is simply invalid, and even more people asking whether or not this is a rehashing/re-release of a few older OpenSSH timing vulnerabilities || CVE-2006-5229. I decided to do some analysis myself to verify exploitability as well as learn a little bit about the unavoidable semantics of yet-another-timing-attack. modern configuration due to the fact that it takes much longer to calculate SHA256/SHA512 hash than BLOWFISH hash. source code. On this hard coded password structure the password hash is based on BLOWFISH ($2) algorithm. response time from the server for non-existing users. NOTE: Mr. Harari tested this on opensshd-7.2p2, while my testing was done on OpenSSH_6.9p1. Cannibalizing the code shared by Mr. Harari I wrote up a PoC that would allow me to get the data I require to verify this vulnerability's authenticity. print "Usage: "+sys.argv+" uname_list.txt host"
I ran 3 separate tests (a total of 4688 requests) letting it continuously iterate through my list of account names (valid and invalid), and write the results to a csv for analysis. Included below are the two main tests and their results. Valid Users: realuser & test. Valid Users: justice, realuser, enumme. We can plainly see that the existing users take significantly longer than the rest. Currently working on developing a effective response-timing threshold for tool based determination of "valid" usernames, as well as emulating all of this functionality in C.
Below is the first version of the "weaponized" exploit for this. 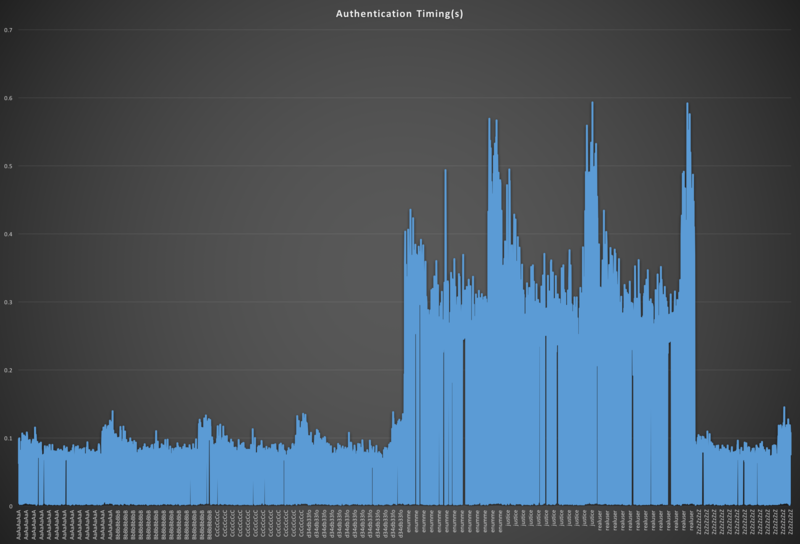 It is currently based around a 10-30% range of deviation for timing(s) of valid versus invalid usernames. Currently only >20% are accepted as a valid usernames and appended to the output list accordingly (feel free to tweak this within the script). This has proved effective for me. print "Usage: "+sys.argv+" uname_list.txt host outfile"
print "- Connection logging set to paramiko.log, necessary so Paramiko doesn't fuss, useful for debugging." print "- Calculating a benchmark using FAKE_USER for more accurate results..."
print "[-] List is empty.. what did you expect? Give me some usernames." Get true threads working for efficiency (right now it's rather slow); had issues with timing when true threading was used (also tried subprocesses). If someone gets this feel free to let me know, I would gladly update this. Re-release in C. Added to the bitbucket repository; All credits for the C rendition go to my friend and wonderful artist Anthony Garcia.